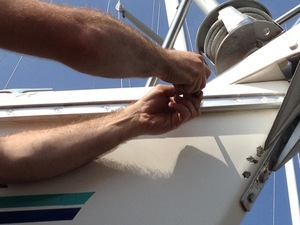 I was recently presented with the task of replacing a rub rail on the 1996 Catalina 36. This project can really give your boat a fresh look and of course help protect your boat with minimal cost. You will want to start by removing the existing rubber. This part should be pretty self explanatory. Take the screws out of the ends and just pull it out. If you are not replacing the aluminum track you can skip the next few steps. The track that I removed had a combination of screws and bolts fastening it to the hull. 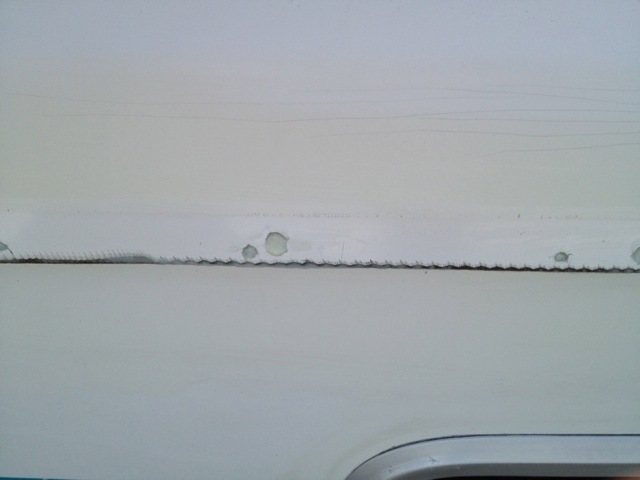 If this is the case with your boat I recommend starting by removing the screws first. You can use your power drill to do this, just be careful not to strip the screw heads. Now comes the fun part: the bolts. You will need to access the back sides of them in order to access the nuts and the washers. Fortunately, Catalina simply hid them just behind the wooden trim rail just under the hull deck joint inside the cabin. Just remove the screws holding the wooden trim rail in place and there they are. Have your friend go in the cabin with a socket wrench and use your drill/screwdriver to remove the bolt. In my case I the holes on the new track did not line up with the old bolt holes. So, I elected to fill the holes and abandon the bolt holes all together in favor of screws. 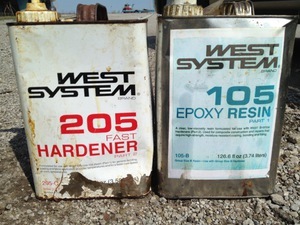 To keep the water out I filled the old holes with the West System Epoxy and filler. 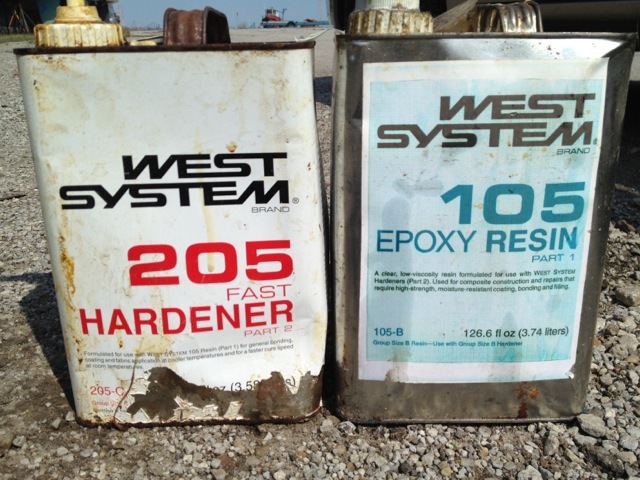 You will need to start by mixing the two components of the epoxy in the proper ratio. Then mix in the filler SLOWLY until the mixture is almost the constancy of peanut butter. Take your putty knife and use it to force the filler into the screw holes. Try to make sure there are no voids. Fill a few more adjacent holes then use your putty knife to scrape off the excess fairing compound. 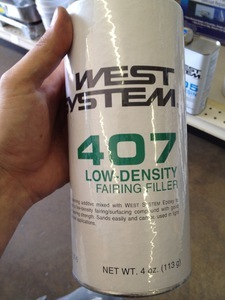 Use the acetone on a rag to wipe away the fairing compound residue around the holes. It is likely that the compound will sag and or sink into the holes as it dries so you may want to repeat the previous step for a smoother finish. Keep in mind that the compound can be sanded the next day. Protip: Once you put the fairing compound on the holes and clean them up with acetone place a small scrap of wax paper over them to help prevent sagging. Start at the back of your boat and line up the track with the end cap. Have your friend hold it in place. Pick a drill bit with a smaller radius than your screws and drill a hole through the first hole in the track into the boat. 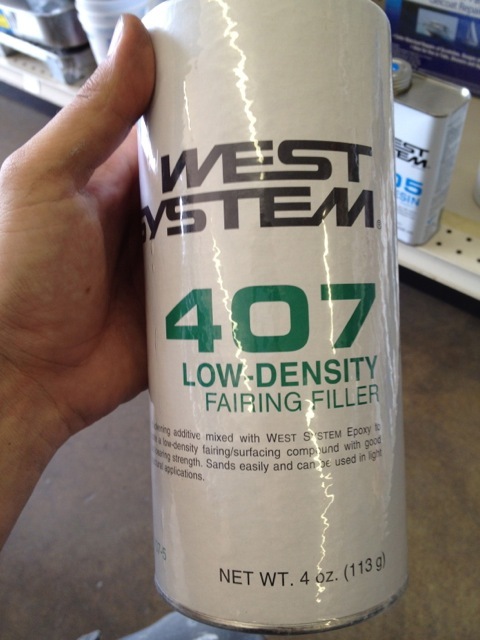 Squeeze some 4200 sealant in there and insert the screw. Do the same in the middle of the track and then at the end. 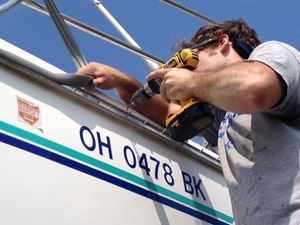 We tacked the track up all the way around the boat this way before we drilled for the rest of the screw holes. However you decide to do it don’t forget the sealant! The rubber can be a bit tricky to install. Make sure you pick a warm day. Start at the stern and squeeze it together and work it in for a foot or so to get it started. For the rest of the track insert the bottom of the rubber in the track soap up the rubber. Then, roll your screen roller along the top of the rubber to flex the top down and use a mallet just behind it to tap it into the track. I have included a video to clarify the instructions.